Gerard Kinghan and Alistair Kirk will renew their rivalry at Kirkistown. The seventh round of the Ulster Superbike Championship will be held on Saturday at Kirkistown on the Ards Peninsula. The Belfast & District Motor Club is hosting the Crown Prince Trophy meeting, when runaway championship leader Gerard Kinghan will be aiming to increase his winning tally after dominating at Bishopscourt in the previous round. His chief opposition is likely to come from Alistair Kirk in the Ards & North Down Borough Council Superbike races as they renew their rivalry. Aaron Armstrong and Ryan Gibson will also be aiming to make their presence felt in the feature class. 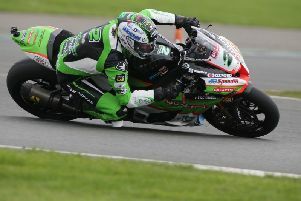 The Supersport races include entries from Darren Keys, Lee Clarke, Dean Campbell and Kirk Dickey, while in the Cup class, Simon Reid will be out to continue his progress up the racing ladder. The Supertwins championship has been highly entertaining this season and is set for a close finish with Cahal Graham, Gary McCoy and Dave Liddy poised to battle it out to the end. In the Production Twins class, which will run in conjunction with the Supertwins, riders including Adam Crooks, Jonathon Hanna and Thomas Hutchinson will have their sights set on the podium. A full set of championship races also features the Pre Injection class, which has been increasing in popularity. Among the favourites for the top step today are Jonny Irwin, Jonathan Gregory, Kevin McGrath and Jonny Hamill. The second Pre Injection race will see the Crown Prince Trophy up for grabs. The race was originally started to promote the smaller classes at the former ‘King of Kirkistown’ events and the class is regarded as a stepping stone to the Supersport and Superbike categories. The Lightweight Supersport races have attracted entries from Dean Campbell, Gary McCoy, Yvonne Montgomery and Stephen McKeown. In the Moto3 class, which incorporates the 125GP and 250GP machines, the line-up includes Ballymoney man Paul Robinson, who is set to retire from the sport at the end of this season. A former125cc British championship race winner, Robinson is aiming to secure the Moto3 title before he calls time on his long career. The 250GP races will see Barry Davidson and Chris Blair vying for points, while in the Classic races, Alex Conroy and Andy Kildea are the key protagonists in the 500cc category. Admission is £10 with children under 12 free (when accompanied by an adult). Practice is scheduled to get under way at 9am and all classes will have a session of untimed and time practice prior to racing.